In 2006, the Association of Fundraising Professionals (AFP) and the Center on Nonprofits and Philanthropy at the Urban Institute established the Fundraising Effectiveness Project (FEP) to conduct research and help nonprofit organizations increase their fundraising results at a faster pace. The FEP launched the Growth in Giving Analytics Initiative (GiG) in 2012 to capitalize on the vast amount of data about giving patterns that fundraising software vendors collect on an ongoing basis. In this report, Giving USA Philanthropy Spotlight: Benchmarking Giving to Human Services, the project has looked at giving to human services organizations, and it has found some interesting and frequently surprising trends. The most important takeaway is that the growth rate of giving to human services organizations increased by 58.1 percent over the six-year period from 2009–2015, compared to the 48.6 percent seen by other nonprofits. 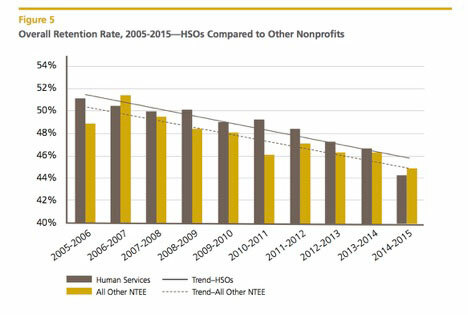 The average amount contributed per donor has increased in recent years (in nominal dollars) for both human services organizations and non-HSO nonprofits. However, the average annual amount per donor has increased at a much higher rate for HSOs, particularly during the Great Recession (2008–2010) and the years since. In 2005, the typical donor to an HSO contributed about $586 overall to that organization. In 2015, that figure had grown to $1,000, an increase of 70.7 percent. For non-HSO nonprofits, the average amount per donor grew from $756 in 2005 to $898 in 2015, an increase of 18.9 percent. According to the Urban Institute, HSOs made up 35.5 percent of all public charities in 2014, but received just 11.7 percent of all charitable donations that year. In contrast, per Giving USA 2016, 32 percent of all donations were given to religion and 15 percent went to education. But the outsized and continued growth of giving to human services suggests the potential of a small shift afoot. The pivot occurred as the recession hit, which is a historic pattern—in times of great financial need, donors turn more of their attention and money to basic needs (see figure 3)—but this time it appears that the HSOs have done better at maintaining and growing the expansion. But before rejoicing, you may wish to consult Figure 5 of the report, which shows the overall plummeting of the all-important donor retention rate with a worse picture in human services overall than in other nonprofits—though their success with top repeat donors exceeds that of others. Complementing the benchmark report is a free tool, the FEP Fundraising Fitness Test. This Excel spreadsheet allows HSOs, as well as every other kind of charitable organization, to analyze their own gift transactions to create benchmark statistics about fundraising effectiveness. Unsurprisingly, larger organizations receiving total annual donations of $2.5 million and up are better at retaining donors. Smaller organizations excel at the less profitable endeavor of surfacing new donors. The Giving USA Philanthropy Spotlight, “Benchmarking Giving to Human Services,” can be downloaded for $19.95 at www.givingusa.org. For more information and access to the free, downloadable FEP Fundraising Fitness Test, visit www.afpfep.org. A healthy organizational culture definitely plays a part in staff retention; would an office wiener dog help?